FINASTERIDE is a type II isoform of 5-alpha reductase. It is an anti androgen, which means that it converts testosterone into DHT. This particular peptide has been deemed useful in the treatment of benign prostate hyperplasia or BPH. If taken in higher doses, it has been seen to be effective in treating patients of prostate cancer as well. Currently research has been going on to study the other beneficial effects of this peptide. At Pinnacle Peptides you get this product in the purest form possible. Needless to say you must be very careful while buying these products in the market, since most of them provides impure or diluted products. But Pinnacle Peptides understands your need to have pure peptides to receive accurate results. 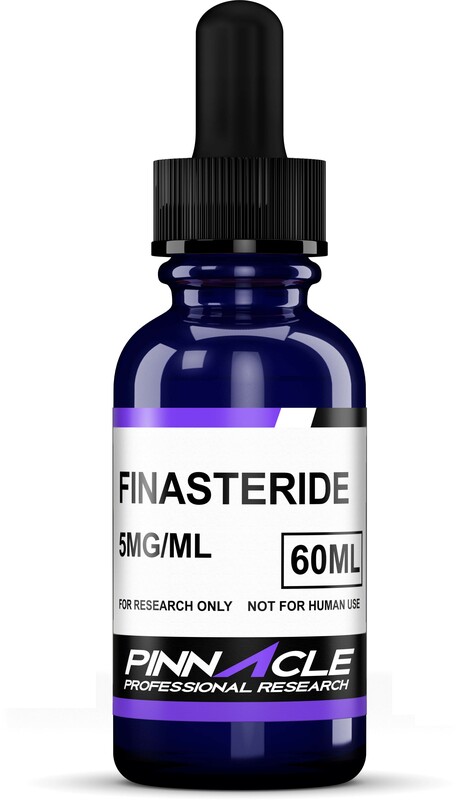 When buying FINASTERIDE trust Pinnacle Peptides to provide you with the purest forms Preliminary research on Finasteride has shown that this peptide could be effective in the treatment of prostate cancer. However these studies are still debatable. Much research has been going on related to this peptide currently. If you require the peptide for your experiment, you can purchase the vials as per your requirement and place the order at the website. Deliveries of this peptide can be made at your place, whether you live in USA or anywhere in the world. However, we this and other peptides are for research purposes only and not for direct intake by individuals. The product FINASTERIDE acts as a DHT inhibitor and is basically a liquid solution which is still been contemplated upon by the scientists and is thus being useful as a lab supply. Mostly researchers, who require this product, need other chemicals too. They need other lab supplies to aid their experiments. Pinnacle Peptides provides you with a wide range of peptides for your research. With quality products and best prices you are sure to get quite a deal whenever you shop online. The products we offer are intended for laboratory research use only. In purchasing any of these items, the customer acknowledges that there are risks involved with consumption or distribution of these products. These chemicals are NOT intended to use as food additives, drugs, cosmetics, household chemicals or other inappropriate applications. The listing of a material on this site does not constitute a license to its use in infringement of any patent. All of the products will be handled only by qualified and properly trained professionals. All customers represent and warrant that through their own review and study that they are fully aware and knowledgeable about the following: Government regulations regarding the use of and exposure to all products. The health and safety hazards associated with the handling of the products they purchase. The necessity of adequately warning of the health and safety hazards associated with any products. Pinnacle Peptides and www.pinnaclepeptides.com reserves the right to limit and/or deny sales of products to any unqualified individuals if we have reason to believe that misuse will occur.